Your tires can come out of alignment for many reasons. Something as simple as hitting a pothole can knock it out. Normal wear and tear can also be the culprit. Collisions will almost certainly throw off your wheel alignment. Whatever the reason may be, it isn’t hard to diagnose if you need an alignment. Is your steering wheel off center when driving straight? Or maybe your vehicle pulls to one side or the other when driving straight. Both of these are signals you need a tire alignment. Silver Lake Auto & Tire Centers in Brookfield, WI provides accurate wheel alignment that is fast and friendly to the community and surrounding areas. Call 262-804-9969 or stop by anytime to our 17495 W Capitol Dr Brookfield, WI 53045 location. Walk-ins and same day service are available and welcomed. Tires are often ignored but more attention should be paid to them. Every other time you fill-up with gas you should inspect your tires and check the pressure as well. Look for uneven wear, bald spots, and cracks. If you take these little precautions, you can save yourself valuable time and money in the end. Just like an oil change, regular tire maintenance is necessary and will not only extend the life of your tires but also improve gas mileage. When we perform a wheel alignment one of our ASE Certified Techs will put your car on a lift and hook your tires up to a special machine that measures camber, caster, and toe. They then make the necessary adjustments and ensure your tires are parallel and in the proper position. 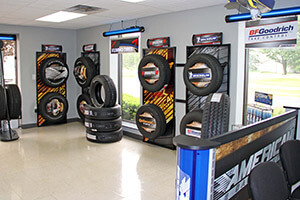 Included in this process is an inspection of your tires air pressure, tread, balance, and wear. Additionally, your suspension will also be examined. We perform a full inspection to ensure your safety and help you avoid unexpected auto repairs and inform you of upcoming services that may be necessary. We are locally owned and operated and know how frustrating auto maintenance can be. Our goal is to keep your car out of the shop, not in it. Customer Service is very important to us and we have a great reputation to uphold in the community. Silver Lake Auto & Tire Centers in Brookfield has served the community for years and pride ourselves on being a no pressure, dealership alternative, local maintenance, and repair shop. Additionally, we offer free local shuttle service and have a comfortable waiting area for your convenience. Let us provide you top-notch maintenance and peace of mind. Call 262-804-9969 , stop by 17495 W Capitol Dr Brookfield, WI 53045 or schedule service online.